After a particularly brutal birthday hangover, Joanne Ryan starts to question her future and her legacy. Until then the thought of children had always been a distant ideal which she thought would inevitably come about at some point. But now it really requires some serious thinking, as she feels compelled to make a decision. This leads to an examination of the choices she faces, and is contrasted to great effect against Ireland's dark history of family planning; where until very recently women had no choice. 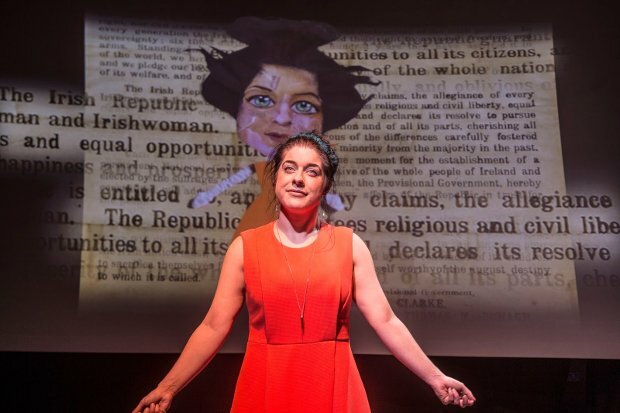 At regular intervals throughout Ryan's investigations, a screen gives a compact history lesson in Ireland's shockingly archaic attitude to women and pregnancy, comparing Ireland's timeline to the rest of the world's. Ryan's character is frank but warm and she does well to keep the audience laughing at her bumbling investigations, despite the dark truths revealed. Watching her type health questions into Google, then seeing the overwhelming volume of search results on screen is hilarious and at the same time frightenly familiar. This is a play which deals with some unsettling political truths, historical and current. But by bringing it back to a personal level, Joanne avoids going on an angry (and justified) rant, but instead explores the reality of parenthood with the warmth and care it deserves. Joanne Ryan Looking down the barrel of her final fertile years, one modern woman goes on a comical quest to uncover the ifs, hows and crucially the whys of reproducing her genes. Thinking outside the box in an effort to decide what to do with her own, eh, box, no stone is left unturned in this journey of extremes.